The Freedom military ring is handcrafted by Balfour. 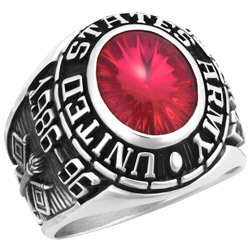 Personalize the wording around the stone, stone color, side emblems and engravings. The oval stone is 12mm x 10mm. Valadium® is a fine jeweler's stainless steel, with silver toned looks that is value priced. Contains 12% nickel. Sun-lite Valadium® features the durability of fine jeweler's steel, electro-charged with the look of yellow Gold. Contains 12% nickel.